SYRACUSE, N.Y. - The Pawtucket Red Sox dropped both games of their doubleheader against the Syracuse Mets on Saturday afternoon at NBT Bank Stadium. After Friday's matinee was rained out in central New York, the Chiefs took a pair to seize the edge in the four-game series ahead of Sunday's finale. In game one, Syracuse overcame an early 2-0 deficit by scoring in the second, third, fourth and sixth innings to grab a 6-3 win. Tony Renda, who was Thursday's hero in the season opener with a bases-clearing double in the 10th inning, pulled a two-run homer to left field in the second inning. Chandler Shepherd fanned six in five innings in which he ceded four earned runs. 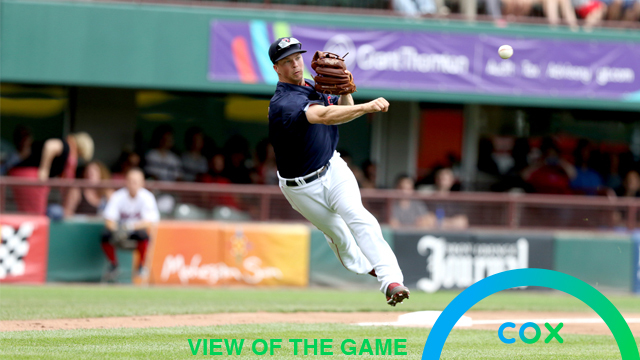 Later in the afternoon, the PawSox climbed out to a 2-0 lead in the top of the first inning of the nightcap thanks to a two-run jack by Gorkys Hernández, who added a sacrifice fly in the fifth inning to stretch Pawtucket's lead to 3-1 into the late innings of the scheduled seven-inning game. But a pair of errors in the sixth and seventh innings allowed Syracuse to tie the game in the seventh. Hernández, however, did force extras with an outfield assist to home plate that nabbed Gregor Blanco on a would-be walk-off sacrifice fly. In the eighth, Syracuse reeled in its automatic runner on a walk-off RBI single from Adeiny Hechavarria. Erasmo Ramírez, Dan Runzler and Domingo Tapia each worked two innings in the nightcap. The PawSox conclude their series in Syracuse on Sunday at 1:05 p.m. Pawtucket right-hander Josh Smith is scheduled to oppose Syracuse righty Chris Flexen. Radio coverage on WHJJ (920 AM and 104.7 FM) and throughout the PawSox Radio Network begins with the pre-game show at 12:35 p.m.
Pawtucket's home opener is slated for next Thursday (April 11) at 6:05 p.m. Good tickets are available, and fans can visit the McCoy Stadium box office, which is open Monday-Friday from 10 a.m. through 5 p.m., and during all home games. Fans can also call (401) 724-7300 or log on to PawSox.com for tickets.